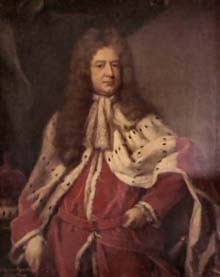 Sir Robert Shirley, Baron Ferrers, Viscount Tamworth was created 1st Earl Ferrers in 1711. He was born at East Sheen and baptised at Mortlake, his father being a prisoner in the Tower of London at that time, where he died. Robert married twice, having seventeen children by his first wife who died in 1693. In 1699 he married Selina Finch, the daughter of a London merchant, described as "a young girl who has no portion". She provided him with five sons and five daughters. It has been said that he sired a further thirty children out of wedlock. At this time the principal residence of the family was Staunton Harold, north of Ashby de la Zouche in Leicestershire. There was also property at Tamworth and Ettington, in Warwickshire and an Irish estate. Robert was descended from, among others, Robert Devereux, Earl of Essex, executed for treason by Queen Elizabeth. In 1711 he bought Heath Lane Lodge and it came with about 24 acres of ground; its modest name did not truly describe what was an enormous mansion, the largest in Twickenham. The land extended north across what is now Heath Road, up to the river Crane and south down to adjoin what became Alexander Pope's garden. The property had been owned and perhaps built by Thomas Boucher, reputed to have made, and lost, a fortune by gambling. He died in 1708 leaving a widow who remained in Twickenham until 1734. Boucher's antecedents are not known and it has been suggested that he had been, at one time, a footman in service. Earl Ferrers extended the estate further by buying the meadow across the road (Cross Deep) at the southern end of his garden and running along the riverside, in 1716. This 1� acre piece cost him £960, a high price, perhaps reflecting competition for riverside land in Twickenham. He died, in Bath, on Christmas Day 1717. Countess Ferrers remained at Heath Lane Lodge for the next 45 years, dying there in 1762 in her 81st year and she is buried in the churchyard of St Mary's, Twickenham. In about 1719, she built a summerhouse facing the river. 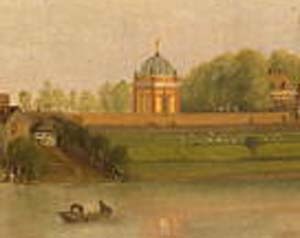 The earliest picture of this building is on Peter Tillemans' A Prospect of Twickenham painted in about 1725. For size it compares with the Octagon built by James Johnston to the design of James Gibbs, farther down the river. Nothing is known of its designer. When, in 1788 the Heath Lane Lodge estate was sold it was described as a "temple" in the Particulars, but by this time it was probably derelict and shortly after, demolished.